Oakland is often compared to Brooklyn, New York. But did you know that much of East Oakland actually used to be called Brooklyn? Laurel Hennen Vigil is a senior at Oakland Technical High School. The Express is running her history columns throughout the 2015–16 school year. As increasing numbers of people arrive in the East Bay after being priced out of San Francisco, it seems that everyone — including The New York Times — has dubbed Oakland "Brooklyn by the Bay." It's easy to see the comparison: Both are (slightly) more affordable spots that draw young people and creative types from their wealthier and more celebrated neighbors. 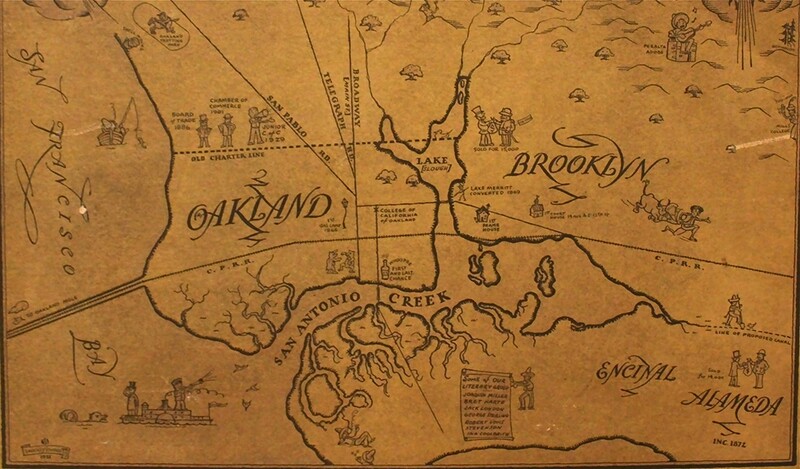 But did you know that much of East Oakland actually used to be called Brooklyn? "The town of Brooklyn was small and short-lived," said local historian Gene Anderson, who leads tours of the area for Oakland Urban Paths. "It only existed from 1856 until 1872." In the 1850s, much of the land that now falls within Oakland city limits consisted of an assortment of smaller towns. Brooklyn was formed from the combination of these villages, eventually stretching from the eastern edge of Lake Merritt to what is now Fruitvale Avenue, and from what is now MacArthur Boulevard to the shores of San Francisco Bay. One of these towns was San Antonio, founded in 1851 when James B. Larue, an early pioneer in the region, purchased a swath of land from Luis Maria Peralta's Rancho San Antonio. This land is still known as the neighborhood of San Antonio. Larue built a wharf at East 11th Street and 14th Avenue, as well as the town's first store. He later went on to found the Oakland and San Antonio Steam Navigation Company, a ferry line that transported daytrippers from San Francisco and loggers to work in the East Bay hills. Another town that made up what would become Brooklyn was Clinton — which, like San Antonio, is now known as the neighborhood of Clinton. In 1849, failed gold miner Moses Chase built a wood-frame house — one of, if not the earliest in the area — at the corner of East 8th Street and 4th Avenue. The house, now long gone, stood on what is now part of Laney College. Chase joined with three brothers, Robert, William, and Edward Patten, who had come to the East Bay on a whaling boat in 1850, to lease 640 acres of Peralta's Rancho San Antonio. The town they founded together in 1854 was named for Chase's late fiancée, Mary Ellen Clinton. 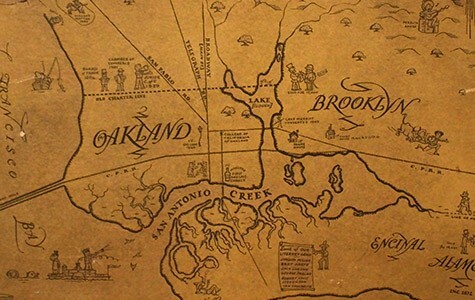 In 1856, a few years after San Antonio and Clinton were founded, the two settlements joined together to create the town of Brooklyn. Our Brooklyn didn't derive its name from New York's famous borough — at least not directly. Instead, it was named after the ship Brooklyn, which, in 1846, carried more than two hundred Mormon settlers from New York to California. One of those settlers was Thomas Eagar, who became a member of the Alameda County Board of Supervisors. It was Eagar who suggested the consolidation, as well as the name of the new town. Many businesses and churches quickly sprang up in Brooklyn. The town gained a shoe and boot factory when it absorbed the adjacent village of Lynn (now the neighborhood of Lynn) in 1870. In 1871, Brooklyn's enormous two hundred-room Tubbs Hotel opened, occupying a whole city block between what is now 4th and 5th avenues on East 12th Street. Gertrude Stein's family lived in the hotel for about a year when she was a young child. Other guests included Treasure Island author Robert Louis Stevenson, as well as Key System founder Francis Marion "Borax" Smith. Unfortunately, in 1893, after the hotel was partially destroyed in a fire, it was demolished. In addition to urban developments, the town of Brooklyn housed a park called Independence Square (now San Antonio Park), where "all public festivities, as well as rodeos and hangings, were held," according to the May 7, 1914 issue of the Oakland Tribune. Brooklyn was governed by a board of trustees, led by the town's first and only mayor, Harrison Allen Mayhew, who was elected three times. Town Hall was constructed in 1850 and burned down on March 25, 1921. On October 21, 1872, a majority of Brooklyn's 1,800 citizens voted to allow annexation by Oakland, believing that "both places will grow faster and more rapidly obtain a position of commercial importance," according to that week's Brooklyn Home Journal. Despite this, the town retained its own identity, with many businesses (and one street, Brooklyn Avenue, near Park Boulevard) keeping the appellation. The Central Pacific Railroad station was called Brooklyn until 1883, when the Southern Pacific Railroad took over the line and renamed the stop East Oakland. Today, what was once Brooklyn is now part of East Oakland, encompassing the neighborhoods of Bella Vista, Cleveland Heights, Clinton, East Peralta, Highland Park, Highland Terrace, Ivy Hill, Lynn, and San Antonio. "Many people think of the area as mostly newer apartments and stores, but there are [still] numerous beautiful Victorians," said Anderson. "If, instead of driving through on International [Boulevard] or one of the other main streets, people take the time to explore, they'll realize just how much [Brooklyn] history is still around." Oakland Urban Paths' (OaklandUrbanPaths.org) next walk, on February 13, will explore the former Brooklyn area of Cleveland Heights and the "Borax" Smith estate in Ivy Hill. So the next time you see Oakland compared to that other hipster haven 3,000 miles to the east, allow our own Brooklyn to serve as a reminder that Oakland has a culture and history all its own. Correction: The original version of this column misspelled the last name of Thomas Eagar, the settler who suggested that the towns of Clinton and San Antonio consolidate into one called Brooklyn. The festival is coming to City Hall on the weekend of May 22. Oakland's Mountain View Cemetery is filled with engrossing historical details, gorgeous landscape architecture, sunny meadows, and stunning vistas. During the Golden Age of cinema, Oakland and Berkeley boasted dozens of grand, historic movie palaces.